2. Single drive mechanism to avoid glue sticking to roll surface when stopping. 3. 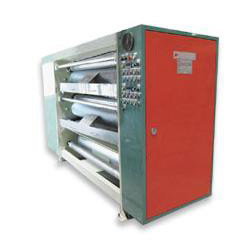 With upper pre-heat roller x2 and lower pre-heat roller x1, in order to preheat single face and liner. 4. Manual control slight adjusts the thickness of glue. Opened and closed by pneumatic cylinder system. 5. Build automatic glue supplied, maintains easily. 1. Model: GM-3. Width of paper: 1400. 2. Model: GM-4. Width of paper: 1600. 3. Model: GM-5. Width of paper: 1800. 4. Model: GM-6. Width of paper: 2000. 5. Model: GM-7. Width of paper: 2200. 6. Model: GM-8. Width of paper: 2500.